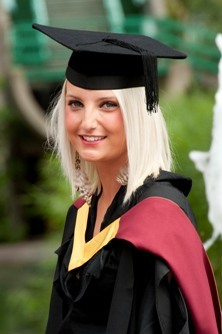 Celebrity stalking, especially the use of the internet by criminals looking to track down their prey, was the subject of Gabby Cox’s studies at City University London. 22 year old Gabby Cox, from Bristol, was among over 1,500 students who graduated from City University London during ceremonies held in London this week. Accompanied by her mum, dad, sister, boyfriend, step-mother and step-sister, Gabby was very excited to be the first in her family to receive a university degree. Gabby, who grew up in Bristol, where her family still lives graduated with a First in a BSc in Sociology and Criminology achieved particularly high marks at university following her in-depth exploration of stalking in her final dissertation. "I was really lucky to be able to arrange interviews with detectives from the Avon and Somerset and Wiltshire constabularies, who specialise in this area, as well with a representative from a major stalking focus non-profit organisation, the Suzy Lamplugh Trust," says Gabby. "Studying in London was fantastic, living in the University Halls I made lots of new friends and it was a real advantage to study in such a diverse area, particularly when it comes to classroom debates about criminology and sociology I was exposed to a lot of different views that I hadn't heard growing up in Bristol. I want to stay in London and am now searching for somewhere to live." Gabby also worked as a student ambassador during her time at University, visiting Schools to talk to year 10 students about what studying at University is really like. She says that she is hoping to eventually get a job in the police force.